Great 4 bedroom home with large deck and spectacular view of the Golf course and surrounding Mountains! 4 bedrooms with sleeping loft that sleeps 3 (kids love this) Bedrooms are one queen upstairs with connecting bathroom, downstairs two with a double bed, one with twin beds. (8 in beds). Second bath is downstairs. Three in sleeping loft on a queen mattress and a sleeping mat, one day bed upstairs, Linens, towels, cleaning and taxes are included. Private wooded lot on quiet dead end street with a charming stream at the end. Relax on the deck in the morning with a cup of coffee. You will never want to leave! This house is a favorite for gathering with friends and family! The great room connects the kitchen, dining area and den to create a warm and cozy area to gather and make memories! Cards and board games will enhance your fun while gathering together. You will want to come back every year! The home is located jus a minute inside the back entrance to Sugar Mountain, which is near the Food Lion. We love picking fresh blackberries,and blue berries and making a homemade pie. (alamode of course). There is so much to do in the area that we continue to find new places and things to experience! Look up Mountain Times for local events. This is published each week on Thursday. My mom found this beautiful area when I was a child. Only 2+ hours from Charlotte and 15 degrees cooler! I bought this home from my father when he was putting it on the market 10 years ago. I could not live with out this wonderful home! I grew up coming here as a child and have loved it for 30 + years. You will love the area if you havent visited before. The home is very close the back entrance to Sugar Mountain. Perfect location and accommodations for our couples getaway! Minutes from hiking the falls, brewery and golfing. Ended the days cooking out on the deck and enjoying the gorgeous views! Very comfortable beds and lots of charming touches. The owner Jenny was great, very grascious and knowledgeable on the area. We will definitely book this for our next trip! 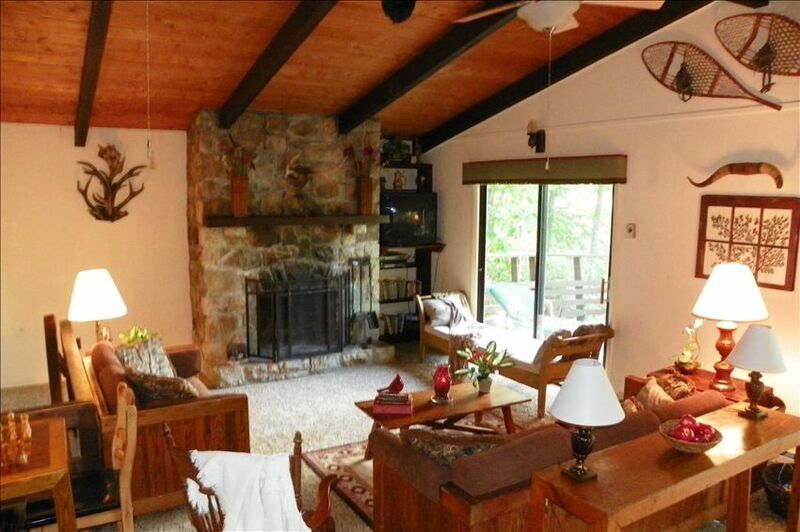 Very comfortable home close to Banner Elk ! Lovely mountain home in quiet neighborhood but close to all the places our family wants to be. Will definitely return for ski season. So close to Sugar and main road. Very cozy and nice cabin. Very nice and cozy cabin, they have a beautiful stone fire place and a nice open area to enjoy the view Of the mountains with big windows. Including the porch where we sat out and watched the stars. One of my favorite places I've stayed in the area. We love rentng this spot for the Bristol race! The house is in a great spot at Sugar Mountain with the race track about 45 minutes away. Love the loft and we always fight over the day bed because it is so comfortable to fall asleep on while hanging out watching TV. Its a great deal because usually 8 of us go and it would cost much more to rent hotel rooms. The house is on a dead end street and is very private with few people ever around. The view from the deck of Beech Mountain is great, and we love having fires in the great room. There are great restaurants and grocery stores right around the corner. We like The Bayou restaurant the best because it stays open late. The home owner is very helpful and easy to deal with. This is the place I always like to stay. I saved the unit number in my phone notes! We loved staying in this house! There was plenty of room for all of us, and most importantly - it was so clean that we could let the children play and roll on the floor! The house is very comfortable, and the living space is beautifully set and decorated. If we go to Sugar Mountain again, summer or winter, we want to stay in this house again! And dealing with the owners was very pleasant and prompt! Fantastic time! This cabin is perfect for multiple families. We had 8 adults and 2 children and did not feel cramped. The location is great. You can sit on the deck and watch tubing. The kitchen is well stocked and we had plenty of room to sit down and eat in the dining area. Having the den downstairs is handy for separation or for the kids to hang out. I will definitely rent this cabin again if I am traveling with a group. Owner was quick to respond and easy to work with!